Go modern with this droplet-shaped accent table lamp, a perfect match for a small side table or hallway console. Get contemporary with this beautiful table lamp design. The droplet body is impressive with a brushed nickel finish and fluid lines. The striking white drum shade looks crisp and clean and contributes to the vertical interest of this modern design. Overall: 17" high x 6 1/2" wide. Shade is 9 1/2" high x 6 1/2" wide. Weighs 2.2 lbs. Takes one maximum 60 watt standard base bulb (not included). On-off socket switch. 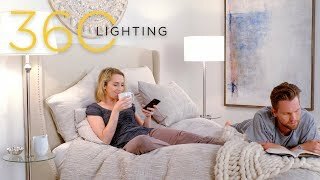 Small size table lamp for bedside tables and more, from the 360 Lighting collection of accent lamps. Droplet-shaped base - clean, modern style. Brushed nickel finish. White cylinder shade. Perfect size for small reading nook table. Perfect size, color and wattage. Wanted it for an accent table in my living room, so it could be connected to a nightly timer - most smaller lamps are only 40 watt. This should be just right! Need shorter entry way lamp. It goes perfectly with my floor lamp and table lamp. They are all the same design but different types of lamp. My room will have a pulled together, cohesive look that's clean and up to date. Beyond excited to find this lamp! How does this lamp turn on? Do you tap the base or is there a switch? BEST ANSWER: Switch located at the socket. Is the shade a spider or uno? BEST ANSWER: Hi - This includes a spider shade. What is width of lamp base? BEST ANSWER: This is not a cordless table lamp. The cord connects to the electrical outlet. What is the total height of the lamp with the shade on it? BEST ANSWER: Hi Tami - The total height of this lamp is 17-inches, including the shade. thanks. I have purchased lamps that don't include the height of the lamp shade..
As the description says, from the bottom of the base to the top edge of the shade, this lamp is exactly 17" high. Dah...I measured and the 17 inch mini droplet accent lamp with shade on is...17 inches! BEST ANSWER: The on/off switch is located at the socket. rotary lamp switch is on the bulb socket just above the bottom of the shade. What kind of "attachment" is used for the shade. Is it the kind with a filial or one that fits over the bulb or socket? BEST ANSWER: The shade is attached by a filial. A harp attaches down by the socket and the filial is at the top of the shade. I have a 60W equivalent bulb and the lighting is even and nice for a desk lamp or end table. I really like it! no, the shade support is the standard loop that attaches to the base not the bulb with a nice heavy threaded ball to hold it down. I have two and they are high quality. We looked forever for bedside lamps, and these fit the bill perfectly - small nightstands, so needed smaller lamps that we could still read with - love the clean style and more than adequate lighting provided. These lamps are the perfect size for our diningroom sideboard. The shade quality is nice. The base is stylish. They do not throw a ton of light, which is great for an accent lighting purpose. The shade glows yellow with a bulb, which I find cozy. I found that the Philips slim style led bulb at 60watts gives an even dispersement of light. This mini has a maxi look! I am using it on a glass and stainless bedside table, perfect match. Seeking additional light in one of our guest bedrooms, yet not having large bedside tables, I chose this lamp: it is perfect! Tastefully understated design; ideal size; ample illumination; as definite YES! Very nice lamp and shade. Excellent finish on all parts. I would recommend this lamp. I love it; it’s the perfect sized bedside lamp for my guest room!